Some very important lessons for the aspiring writer. The best way to use it is to read through it and find the examples where you can’t immediately tell what is wrong, study the explanations, and then apply those learnings to your own writing. I shall always remember my first visit to Boston . My first visit to Boston will always be remembered by me . 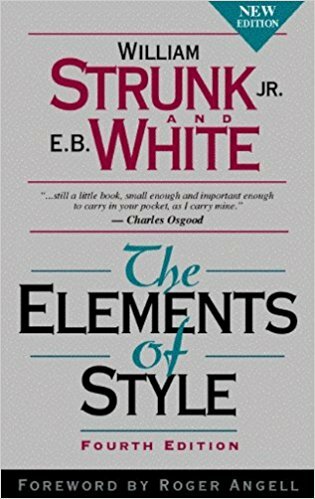 “Many a tame sentence of description or exposition can be made lively and emphatic by substituting a verb in the active voice for some such perfunctory expression as there is, or could be heard. There were a great number of dead leaves lying on the ground. Dead leaves covered the ground. The sound of a guitar somewhere in the house could be heard. Somewhere in the house a guitar hummed sleepily. The reason that he left college was that his health became impaired. Failing health compelled him to leave college. It was not long before he was very sorry that he had said what he had. “Use the word not as a means of denial or in antithesis, never as a means of evasion. He was not very often on time. He did not think that studying Latin was much use. He thought the study of Latin useless. The Taming of the Shrew is rather weak in spots. Shakespeare does not portray Katharine as a very admirable character, nor does Bianca remain long in memory as an important character in Shakespeare’s works. “Consciously or unconsciously, the reader is dissatisfied with being told only what is not; he wishes to be told what is. Hence, as a rule, it is better to express even a negative in positive form. “Prefer the specific to the general, the definite to the vague, the concrete to the abstract. A period of unfavorable weather set in. It rained every day for a week. He showed satisfaction as he took possession of his well-earned reward. He grinned as he pocketed the coin. There is a general agreement among those who have enjoyed the experience that surf-riding is productive of great exhilaration. “In especial the expression the fact that should be revised out of every sentence in which it occurs. “A common violation of conciseness is the presentation of a single complex idea, step by step, in a series of sentences or independent clauses which might to advantage be combined into one. “Interesting. Avoid this word as a perfunctory means of introduction. Instead of announcing that what you are about to tell is interesting, make it so.